Some Boston residents say city plows left their vehicles with bashed mirrors, scraped panels, and dented doors. NECN investigates. It was the snowiest winter in Boston's history, and some residents are paying for it. Plows reportedly damaged dozens of vehicles in the aftermath of the storms, but according to the victims, the city refuses to pay for the extensive damages. "I was like kind of knocking on the wheel, like, 'hey, stop, stop, stop,'" Charles Paizante began. It was February 2 — in the midst of the most punishing winter Boston has ever seen. Paizante was earning a few extra bucks digging out neighbors in East Boston when the Northeastern University freshman says a plow driver smashed right into Debra Patti's car. Vehicles Damaged by City Plows? "He saw completely what he did," Paizante said, "but then he just took off and I was yelling, like 'hey, what the heck' and he just continued off." Patti insists there was no parking ban that night and her 2003 Saturn was parked legally at the corner of St. Edwards Road and Saratoga Street. She says the plow caused almost $1,700 in damage, but the city refuses to pay. Despite the eyewitness, the city told her there was no plow activity there at the time. Case closed- no appeals process. "If I had gotten into a car accident with someone else and they damaged my vehicle, they would have to pay for it," Patti said. Across Boston, Patti's story has a familiar ring. "It was like a trail of devastation up the street," Charles Lautner described the bashed mirrors, scraped panels, and dented doors that lined the road. Residents say it was plows that hit their cars, wracking up thousands of dollars worth of damage. They say no one seems to be taking responsibility. "It's a hit-and-run and that's what the police said," Dustin Thompson, another victim, explained. 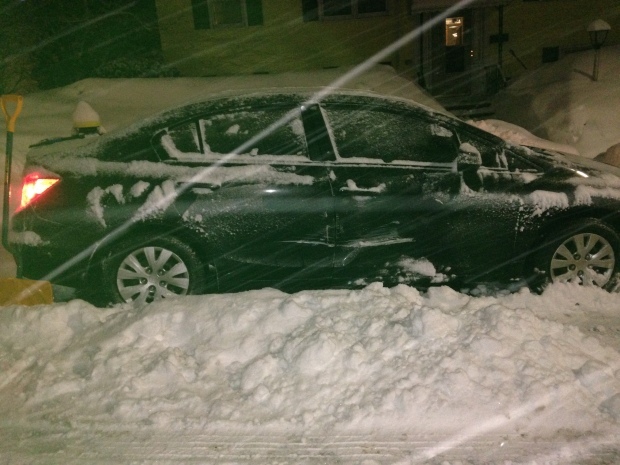 Thompson says his 2010 Acura was scraped by a plow in Southie after the Valentine's Day Storm. He thought he'd have to write off the $938 dollars in damage, until a neighbor came forward. "I took a picture. I got a plate number, the whole deal," said Mitchell Silvia said. Silvia snapped a picture of the back hoe he says sideswiped the Acura on Mercer Street at Telegraph Hill. Thompson took the picture to Boston Police. According to Thompson, the police encouraged him to make a claim against the city, so he did. But a few weeks later, a letter from the city's law department came. Despite the photo, despite the witness, the city denied Thompson's claim, insisting there were no city of Boston vehicles here at the time. "I'm very angry," Thompson said. "What are you supposed to do from there?" According to the mayor's press office, from 2010 to 2014, the city received 198 claims for damage to vehicles or property caused by plows. The city denied 86 percent of them, paying just 28 claims over five years. This year, the city has received 100 claims from January 1 through March 25. While 60 cases are pending, three have been settled and at least 37— or more than a third- have been denied. "It's much easier to deny then it is to investigate," said Bob Harnais, the president-elect of the Massachusetts Bar Association. Harnais says he's troubled by the high percentage of claims denied by the city in recent years. None of the 15 alleged victims necn spoke to have been contacted by any type of city official or investigator. 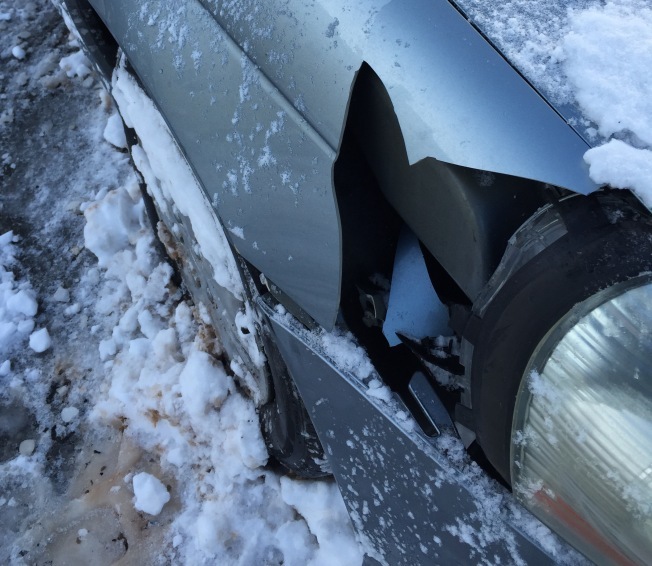 The city denied Moses Bension's claim too, citing that no city plow was in Brighton when his Saab was hit. They did admit a contractor working for them was in the area and they gave him a name, but if Bension wanted to pursue the claim with the city, he'd have to take them to court. "Maybe wishing, hoping that they just go away," Harnais speculated. But Debra Patti says she's not going anywhere. "I know I'm telling the truth. They're lying. I'm not lying," Patti said. And a glimmer of hope for Patti — she got a new letter from the city Monday night. They've decided to reconsider her claim.